In the enchanting scenary of Baia di Porto Frailis, a mere 2 Km from Arbatax, directly by the sea, with a beach of fine sand and water so transparent and crystalline, there you will find the four-star Hotel La Bitta. The Lanthia Resort**** is located in Santa Maria Navarrese, in front of the Ogliastra Islands, not far from the beach. Ogliastra is in the center of the eastern Sardinian coast, immersed in an uncontaminated environment, where quality in food, wine and culture are the pleasures through which we live. About 4 km from the town of Barisardo, in the area known as Torre di Barì, you will find the ****Hotel La Torre, which offers its guests all the delights of a stunning beach and a crystal clear sea backed by all the comforts of our modern hotel complex. Everywhere in Arbatax the villagers open their homes to the visitors. In the courtyards you can try a great many typical products skillfully cook by the landlords and offered at a great price. The celebrations are underlined with music stalls and attractions for all ages. Not to be missed if you are around at this time of the year. 21-22-23 July On these evenings Our Lady of the Sea is celebrated with a beautiful procession in the sea towards the islet of ogliastra accompanied by a wonderful and folkloristic parade. This festival attracts tens of thousands of visitors every year. They come to see the procession but also to look at the many stalls, and attractions for adults and children. There are many places to dine and continue the fun until late. The highlight of everything is on the last day of the celebrations, on Sunday. Everyone gathers at the harbour at about 23.00 to admire the fireworks, which are just breath taking over and over again and are the most awaited happening during the summer. In August, S. Maria di Navarrese becomes a stage for open air concerts with world famous musicians. For a short time, the small coastal village of Ogliastra becomes an important venue for the international music scene. 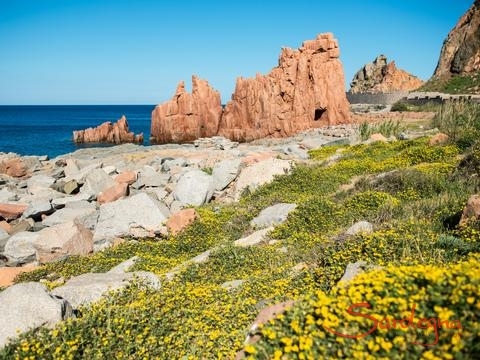 You can find more information about the concerts and tickets in internet Besides, the stunning red rock formations Rocce Rosse are worth a visit at any time of the year! On August 10, each year, the starred Jerzu Wine Festival, a show that combines passion for good wine with music, all in the most romantic night of the year. The party takes place in the old town. You can taste the best wines in the area accompanied by typical delicacies and live music, the setting under the falling stars is lovely. Kayaking, they can learn in a natural way and in absolute silence the paradise coast of Ogliastra. There will be tours and classes offered for beginners and advanced students. It is best to stop in each bay to take swim (or fly almost) in the transparent water. Also worth a visit is the Grotta del Fico, the last refuge of the monk seals, or the Grotta del Bue Marino. Take a warm layer as the temperature in the caves is only about 18 degrees Celsius. You may also bring your own provisions, as bars are only available in the coves Cala Sisine and Cala Luna. From the beginning of May to the middle of October the boats of the Consorzio Marittimo leave the port of Arbatax at 9:00, during the main season at other times. Tickets can be booked directly from the website www.mareogliastra.com without having to print them, so you can also check the departure times at the same time. They offer sailing courses as well as rentals of sailing boats, wind surfing and motorboat. The base is located at Spiaggia di Ponente and the harbour of Arbatax. 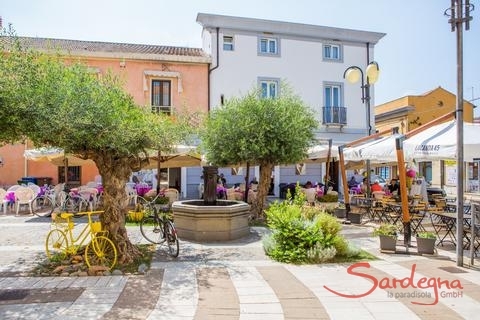 Bari Sardo is a large rural village in the middle of a countryside full of vineyards and fruit orchards. The parish church of Nostra Signora del Monserrato, built between the 17th and 18th century on a Catalan-Aragonese building, and the churches of San Leonardo and Santa Cecilia are interesting to visit. Torre di Barì is a pleasant seaside resort built around the 17th century Spanish tower. The tower was built to defend the village from pirate invasions. The sand beach and the small pine grove are beautiful. The feast of San Giovanni Battista is full of mystery with a ritual that promises rich harvest: the seeds of legumes and grain that have sprouted in the dark are thrown into the sea. They also have an interesting textile trade with workshops in which carpets, wall hangings, blankets and pillows are made of linen. Splendid old buildings, neat squares, a breathtaking scenic backdrop: Lanuse enjoys a magnificent position set in the midst of natural wonders and easily-reachable sites of great tourist and cultural interest. To the west of the inhabited centre dense ilex and chestnut tree forests stretch out in the superb Selene forest. It is full of fresh, cool springs and there is an archaeological complex comprising a Nuragic village with huts and “giants’ tombs”. Just a few minutes beyond the marvellous beaches of Ogliastra, you can reach the Gennargentu mountains, the Villanova lake, the caves of Ulassai and the Tacchi of Ulassai and Jerzu. A few minutes away, you can reach the wonderful beaches of Ogliastra, the mountains of the Gennargentu, the Villanova lake, the caves of Ulassai and the Tacchi, and the vertically sloping table mountains of Ulassai and Jerzu. There is an observatory in the nearby mountains of Armidda. In June, San Giovanni Bosco is honoured with religious rites, sporting and poetry competitions; in San Cosma and San Damiano (August and September), processions, feasts and traditional dances take place (sardegnaturismo.it). Jerzu is certainly known everywhere for the production of the Cannonau (Sardinian for red wine), and a detour to the cooperative cellar is a must during a visit to the village. The village also offers other attractions: the area is rich in Nuragic villages and domus de janas (caves), which are of great interest to Sardinian archaeologists. There are about thirty nuraghi, and at the foot of Monte Corongiu there is a Punic necropolis. In the centre of the village, the Museo Naturalistico ed Ambientale protects the valuable natural treasures around the village. If you are already in the village, you should try the special specialties such as su pani conciu (bread boiled in wine) and is tacculas (thrush boiled in myrtle) with a good glass Cannonau. The most important event takes place on June 13th in Sant'Antonio da Padova. There is also a church dedicated to this saint in the village. In August there is the Sagra del vino and Festival Oglistra Teatro. A family run winery, their main produce is Cannonau D.O.C. From Monday to Friday 10.00 - 12.30 and 15.00 - 18.00. Thanks to the legendary Josto Miglior, the local office physician in 1950, Jerzu Coop Winery was founded and built up by other inhabitants of Jerzu. Forty-five partners treat Cannonau grapes in the best and most fertile vineyards of Jerzu. Cannonau is a famous Sardinian wine with a characteristic flavour and aroma, full-bodied and with an intense colour. The roots of the winegrowing of Antichi Poderi di Jerzu go way back to the 12th century. The arrival of the Spaniards in Sardinia increased the wine production, which involved the whole community and thereby strengthened the leadership role in the surrounding area. 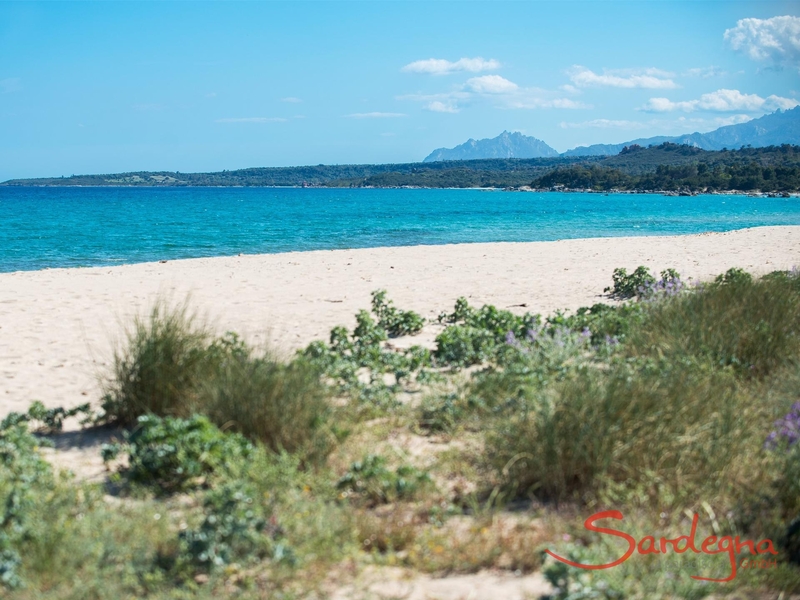 The extensive beach of Orrì is without doubt one of the most beautiful beaches in Sardinia. The fine, white sand and the very low water depth near the shore make it an ideal beach for families with children. On the beach you will find sun umbrellas, loungers and boats for hire. There are a variety of beach bars and restaurants. This little bay of fine golden sand is surrounded by smooth rocks and juniper woods. The easily accessible beach is located south of the main beach of Lido di Orrì. Small sandy beach on the homonymous residential complex. The beach can be reached via Arbatax. Just follow the signs. The beach Foxi Lioni is about 1 Km long. It is a fine, white sand beach with smooth granite rocks and crystal-clear water. It joins south at the Lido di Orrì. In the summer months you can rent sun umbrellas, sun beds and pedal boats and at the beach bar you can buy fresh drinks and snacks. The beach is well suited for families with children, because it slopes slowly into the shallow sea. Take the SS 125 in direction Lido Orrì; pass the Spiaggia dei Milanesi and continue to the beach of Foxi Lioni. The most beautiful beach in the entire Lido di Orrì. Loved by the locals as much as by tourists for its crystal clear and shallow water and its white sand that looks like talcum powder. To get there pass the first beaches of Orrì, drive up to a straight part of the street where you will find a rock with the writing "Il Golfetto" on the left. Then descend all the way to the large parking lot. In the summer there are a bar, sunbeds and pedal boats. This bay is adjacent to a small juniper wood, hence its name. This beach is made of fine sand and smooth rocks. Due to the favorable wind conditions, the beach is also frequented by wind surfers. Take the directions to Lido Orrì and then follow the signs. Chairs and umbrellas can be rented. This one-kilometer-long sandy beach was, until recently, a true secret. Highlights include two high red cliffs, only a few hundred yards in front of the beach from which some brave divers jump into the deep water. It is possible to hire umbrellas, sun beds and pedal boats. Take the SS 125 from Tortoli towards Bari Sardo. Shortly before Bari Sardo follow the signs for Cea. This tongue of land, made of rich black basalt rock, is a paradise for those who shy away from the hustle and bustle of the overcrowded beaches. Here you can snorkel for hours undisturbed in the different bays, or laze on the rocks accompanied only by the sound of splashing water. Take the SS 125 from Tortoli in direction Bari Sardo. At the intersection follow the direction of Cea. 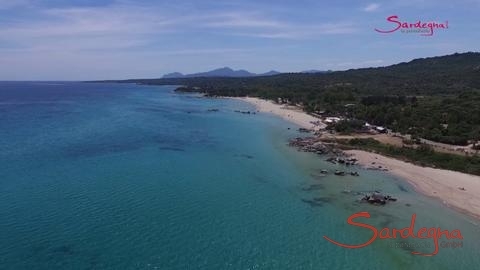 After few kilometers you will reach a second intersection signaling the Spiaggia di Cea. Do not turn off here. A few hundred meters further, turn left onto a gravel road that leads to Punta Niedda. 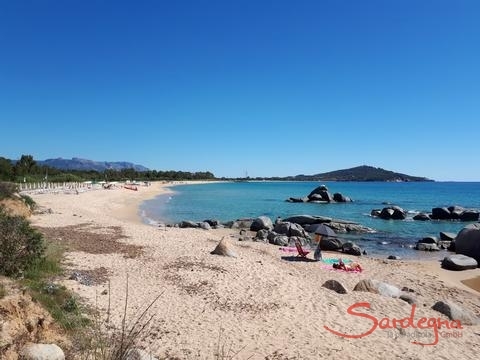 Coarse-grained sandy beach, can be reached via the town of Santa Maria Navarrese. At the entrance to Santa Maria Navarrese take the left down to the beach. Right next to the beach there are bars and restaurants. The beach of the town Santa Maria Navarrese. It has coarse, golden sand. There are sunshades, deckchairs and pedal boats for hire. Small beach bars in a pine grove offer fresh drinks and snacks. Before and during lunch-time they offer protection from the heat. The historic watch tower named after the coarse sandy beach of Bari Sardo is located on a beautiful stretch of coastline of Ogliastra. The water here is crystal clear. Due to the winds this beach is also popular for wind surfers. For children it is less suitable, since it drops sharply into the sea. In the shady pine grove just behind the beach there are several beach bars and restaurants where you can eat well at lunch. Take the SS 125 from Tortoli to Bari Sardo. In the center of Bari Sardo, turn left and drive about 4 km to Marina di Bari Sardo, where you park your car in the parking lot. 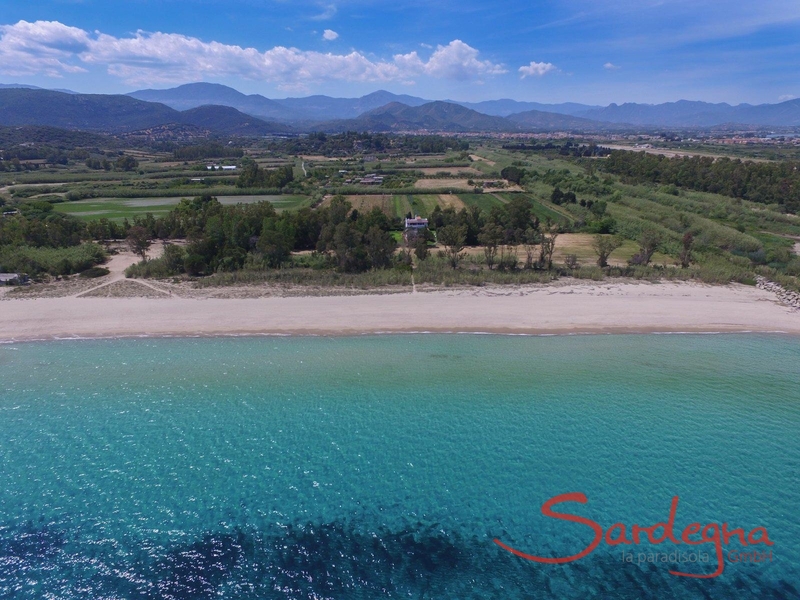 On this, almost 10 kilometers long sandy beach, located south of Torre di Bari, even on hot summer days, one can count the number of sunbathers on the fingers of one hand. Take the SS125 from Tortoli to Bari Sardo. Follow the signs to Marina di Bari Sardo. 500 meters before the Torre di Bari, turn right and follow the signs to the campsite. Pass in front of the main entrance of the camp and after 50 meters turn right onto a gravel road. From this road there are several access roads to the beach. You can park your car directly at the roadside. A nearly 130-meter rocky pyramid in the sea gives its name to this beautiful bay. It is situated along breathtaking cliffs. A true paradise for divers. There is no sandy beach, but you lie down directly on the warm rocks. The water is so crystal clear that even in 15 meters depth you can still see the ocean floor. Take the SS 125 in direction Baunei. Shortly before Baunei turn right towards Pedra Longa and drive down the steep winding road to the sea. This sandy beach is nestled between pink granite rocks and scented Mediterranean vegetation. The beach is accessible only by a narrow footpath. 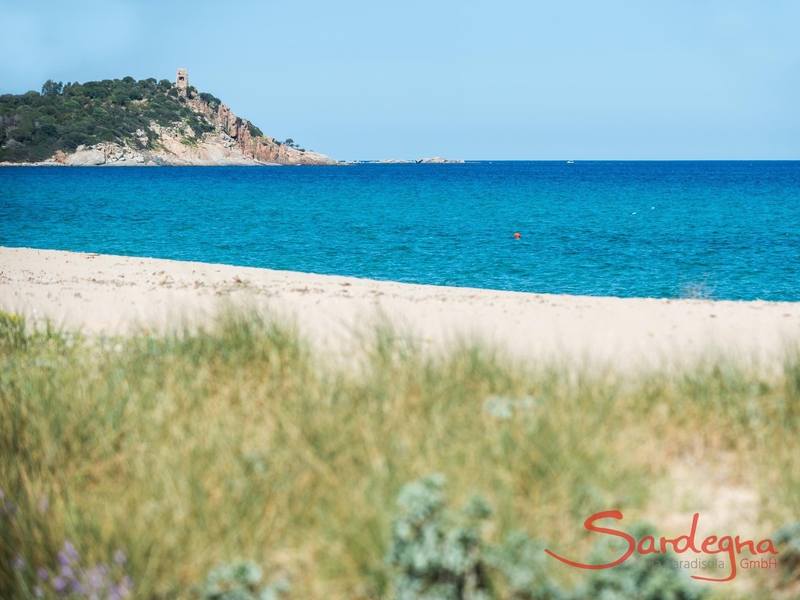 Coming from Bari Sardo towards Gairo mare, look for a small sign that appears after a few kilometers on the coast road just before a curve. There you will then park your car. The beach is at the end of a steep, winding road, nestled between towering mountains. Take the SS 125 in direction Cardedu. A few hundred yards before the town turn towards Marina di Cardedu. Follow the signs to the homonymous campsite Coccorrocci. There is also a small grocery store and a bar / restaurant. 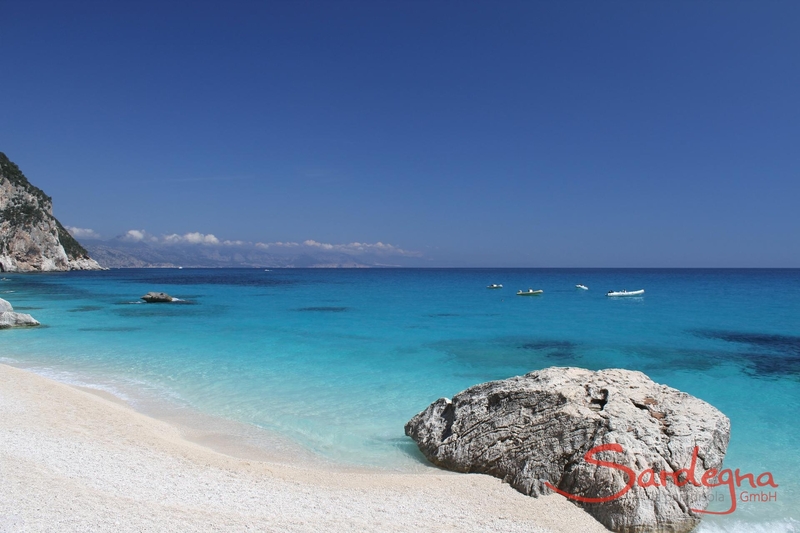 One of the most beautiful beaches on the island, famous outside of Sardinia’s borders. The bay is bordered by jutting rock formations in the shape of archways, which were formed by the wind and waves over the course of time. A high rock needle, very popular with free climbers, towers over the small bathing bay. There are only two ways to reach this spectacularl beach: by boat from Orosei, La Caletta or Cala Gonone, or on foot. A roughly two-hour hike leads from the plateau Su Golgo to the sea. In midsummer, the bay is often overcrowded. A unique bathing bay that lies on a rock wall more than 400 metres high. There is a sandy beach mixed with pebbles. The numerous caves and the extremely clear water are a true paradise for diving enthusiasts. The bay can only be reached by boat, which is possible starting from Orosei, La Caletta or Cala Gonone. Another option to reach the bay is by an especially demanding and unique hiking path called il selvaggio blu (this path also offers access to other beaches). Ideal for a day out with the traditional Sardinian narrow gauge railway is the route to the mountain village of Arbatax Sadali. In Arbatax you can park your car in the parking lot just steps away at the Red Rocks. The winding drive through the beautiful countryside and mountains of the Ogliastra takes about 3 ½ hours. Departure at 7.50 clock in Arbatax, arriving in Sadali at 11.06 o'clock. At Sadali you can have lunch or take a shuttle bus to the beautiful stalactite cave Grotta Is Janas. Return from Sadali at 17.06 o’clock, arrival in Arbatax at 20.20 o’clock. The travel times are subject to change, please check them before leaving. A main attraction of Santa Maria Navarrese, a part form the Spanish church from the 15th Century, is a 1000 year old olive tree. The tree is declared a natural monument; it is nearly 10 meters high and has a circumference of just over 8.5 meters. The small mountain village Gairo Vecchio was destroyed by a landslide in the mid-1950s, after heavy rains. Later, the entire village was rebuilt a few kilometres away on the same slope. The remaining ruins of the old village houses are striking reminders of a long gone time. To get there drive through Jerzu, Ulassai Osini until Gairo Vecchio. About 22 km from Tortoli north and near the mountain village Baunei is the gorge of Golgo, also called Su Sterru. The gorge is declared a natural monument, because of its geomorphologic features. With a depth of about 270 meters there is nothing comparable in Europe. The only 10-meter-wide opening of the karst hole is protected by a high fence. Take the street to Baunei via Lotzorai. Go to the centre of the village Baunei, just before the church you will see the signs to Golgo. A steep road leads to the homonymous high plain. After about 15 km you will see a further sign indicating the karst hole. The small pilgrimage church of San Pietro is not far from here. In the evening you could have dinner in the small romantic restaurant Su Golgo, overlooking the plateau, savoring homemade Sardinian specialties. From Tortoli, take the SS 125 through Barisardo and Jerzu, passing Ulassai, arriving in Osini. Once in place, follow the signs to the Tacchi, which literally means heels. This refers to the rocky plateau, which tower over the small mountain village. A winding, narrow and extremely steep road leads up to your destination. Where the road winds through the narrow rock walls you can park the car and climb over stone steps to the rocky peaks. Here you will be rewarded with a great panoramic view over the mountains. Every Friday morning in the centre of town. The weekly street market in Bari Sardo takes place every Saturday morning in the centre of town. The active holiday specialists Cooperativa Goloritzé offer one-or multi-day trips. Choose from the many offers. If you travel on foot through dense oak forests and rocky landscapes? Take the Land Rover through the wild Ogliastra and hard to reach beaches? Or climb all sporting the meter-high rock walls? With the professional guidance and organization of the cooperative no problem. Beginning at the Golgo plateau, follow a marked path toward Cala Goloritzé. The hike last for roughly an hour and a half. The bay is one of the most beautiful of the whole west coast of Sardinia. It is dominated by a powerful and impressive rock stack formed over the course of time by the influence of the wind and waves. The monolith (rock wall) that surrounds the bay attains a height of more than 120 metres and was declared a "Monumento nazionale". Part of it is reserved for free climbers from all over the world. We recommend that you take this hike during the off-season, since there is a great flood of tourists in mid-summer and the beach is full of people. Park your car near the Su Golgo restaurant, which you can use to keep up your strength for the return trip. The bay can also be reached by boat. This agriturismo is a true secret tip. 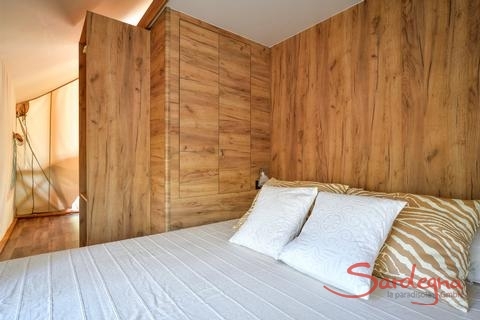 It is situated on the highest plateau above the village of Baunei and is typical, good and cheap. In any case you have to book in advance, and if you are so inclined, you can also take part in one of the various expert-guided hikes. Peter and Anne are specialized in road cycling and mountain biking. But you can book with them also climbing, hiking and canoeing. This restaurant was founded by Signor Lenin, who was conspicuous Communist. Today it is run by his son baptized in the name of the famous cosmonaut Yuri Gagarin. Good seafood in a cosy ambience. Located in Porto Frailis in Arbatax. This small but fine hotel is one of the finest and most beautiful hotels in Sardinia, with excellent cuisine. You are seated on the terrace overlooking the sea. Price level is high. Great place to have a milk shake or take an aperitif. Good Pizza, to try absolutely the seafood pizza with black dough made with cuttlefish or coal. Great street food with seafood sandwiches, fries and alike. Contained prices and always fresh food. In the Michelin Guide named restaurant in an elegant 4-star hotel. Located very near the harbor of Arbatax. Here you will be served Mediterranean cuisine in a romantic and relaxed ambience, we recommend it for dinner. Nice little restaurant right on the outskirts of Bari Sardo. Specialized in traditional Sardinian cuisine. In summer you can enjoy the warm evenings on a small terrace. Just steps from the village church, is this small pizzeria with a courtyard. You can eat delicious pizza but also great pasta dishes. Excellent Sardinian cuisine with sandwiches, salads, first courses, and pizza in a welcoming, bright ambience. Everything is made of typical Sardinian products. Typical Sardinian cuisine and fish specialties. Here mostly regional specialties are served. The restaurant is located on the hotel's swimming pool. The restaurant is situated on the plateau of Baunei and close to the homonymous gorge Il Golgo. Here you can taste the homemade gnocchi with sheep cheese filling, pork and goat, authentic Sardinian style. For dessert, you should try the Sebadas (dumplings stuffed with cheese and served with honey). The restaurant is run by a small cooperative and opens only during the summer months. It boosts a terrace with stunning views across the plateau. This quaint restaurant is located in a beautiful nature reserve, near the route of the narrow gauge railway Arbatax-Manda. For hiking enthusiasts day trips to the nearby natural oases Foresta Montarbu and Foresta Taccu Mannu can be organized starting from here. The restaurant features exclusively regional specialties. Directions on the SS 198 from Arbatax to Isili. Not far from Ussassai follow the signs to your right towards the restaurant Niala. The butcher's meat here is great. Open from 7.30 - 20.30 every day. Located in the centre of Tortolì, this supermarket offerts great quality at good prices. Open daily 7/7 from 8.30-20.30. This supermarket ist not the best but it is the closest to Orrì. Offers a rich choice of food and a large butcher's shop. Here you can buy the best Carasau bread (dry, crispy, thin bread typically Sardinian). The supermarket is in the center of the village, close to the post office. Open daily 8.00-20.00, Sundays 8.00-13.00. Offers diving courses for beginners and advanced students, but also Snorkeling Tours. Experience nature on a new level in our new tent lodge, Orri, on the wild Ogliastra coast, one of the most pristine areas of Sardinia. 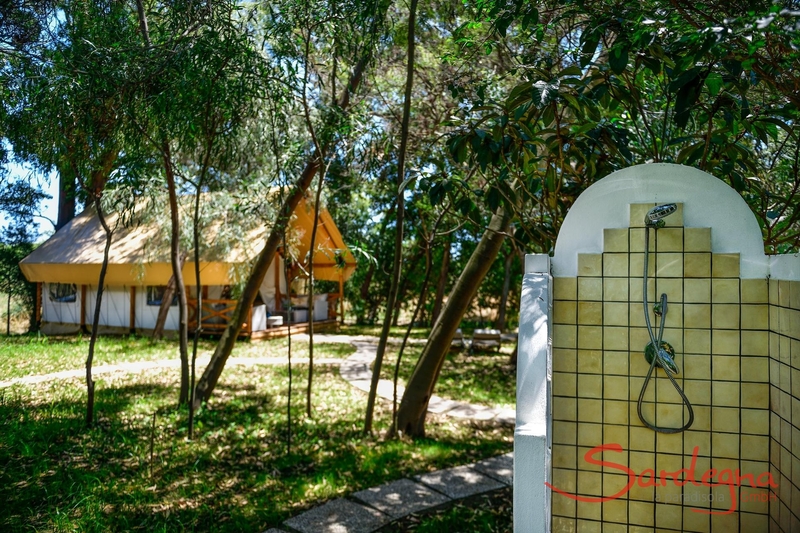 The tent lodge stands alone in a pine forest on the six-hectare plot that belongs to the three Orri apartments. Here you can leave the daily grind behind and immerse yourself in nature. Follow the 30-metre path that leads to the sandy beach to enjoy a dip in the crystal-clear water and all of your visions of the perfect holiday will come true. A stay at our Orri tent lodge is sure to be an unforgettable experience for two or for your whole family. The cleverly designed tent is made of wood, iron and fabric. It has minimal impact on the ecology while offering a lot of comforts: running water, electricity, air conditioning, a parquet floor and a fully-equipped kitchen. The tent has two bedrooms: one with a double bed and one with a bunk bed. There is also a shower room, a kitchenette with plenty of storage space, a sink and an induction hob. A comfortable dining table for four people stands in front of the kitchenette with a view of the trees through the tent entrance. In front of the kitchen and the dining area is a covered terrace fitted with cozy lounge furniture. Outside you can dream under fragrant pine and eucalyptus trees on two loungers. And an opaque outdoor shower is also part of the Orri tent lodge. A washing machine is also available. 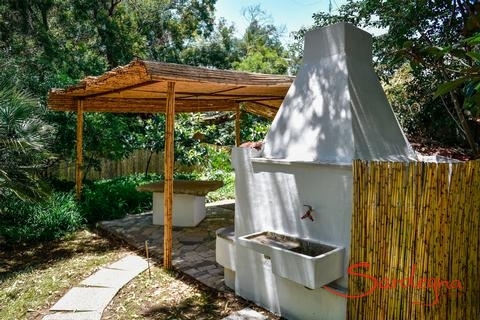 Those who like to cook and eat well will be pleased: the boutique tent has a gorgeous covered outdoor kitchen with a gas cooker, fridge, sink and large brick barbecue. You can serve on one of the two large granite tables; the other table serves as a sideboard for the grill master. The village of Tortoli is only 2 km away and offers good shopping, restaurants and a rich selection of home-grown fruit and vegetables. Living in nature with an easy connection to village life gives the Orri tent lodge an exceptional charm. The most beautiful beaches in the area can be reached in only a few minutes. The small airport is also nearby. Only about two flights land per day in order to ensure the idyllic area remains undisturbed. The nearby Arbatax with its famous red rock can be reached in 20 minutes by car. There is also a romantic harbor with local fish restaurants awaiting you. The "Trenino Verde", a small railroad, leaves from the port and meanders through the interior of Sardinia. Several times a day excursion boats launch headed to the breathtaking cliffs between Arbatax and Orosei. The small sandy coves open into a vast underground labyrinth of caves and caverns only accessible by boat. Beach in front of the tent, 30 m.
Hurray! 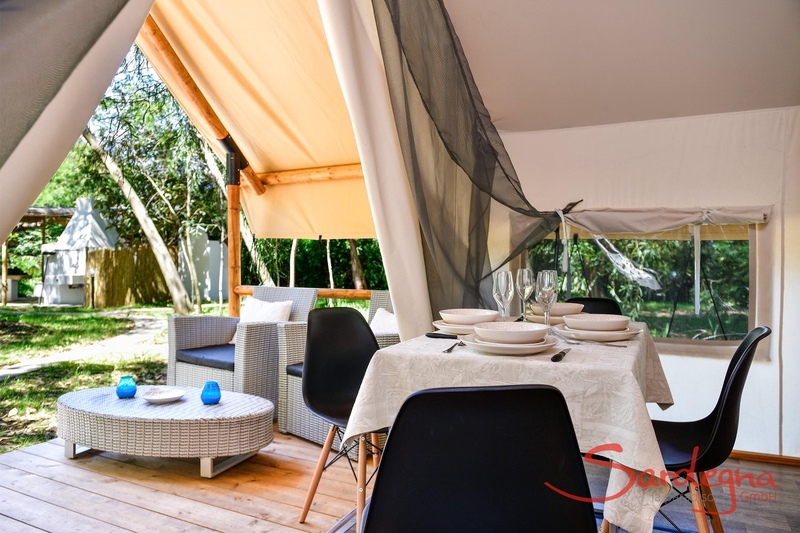 - our tent lodge is hereExperience nature on a new level in our new tent lodge, Orri, on the wild Ogliastra coast, one of the most pristine areas of Sardinia. 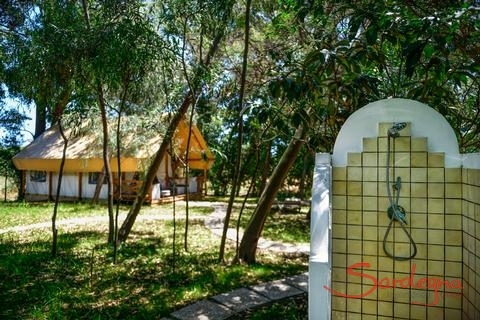 The tent lodge stands alone in a pine forest on the six-hectare plot that belongs to the three Orri apartments. Here you can leave the daily grind behind and immerse yourself in nature. Follow the 30-metre path that leads to the sandy beach to enjoy a dip in the crystal-clear water and all of your visions of the perfect holiday will come true. 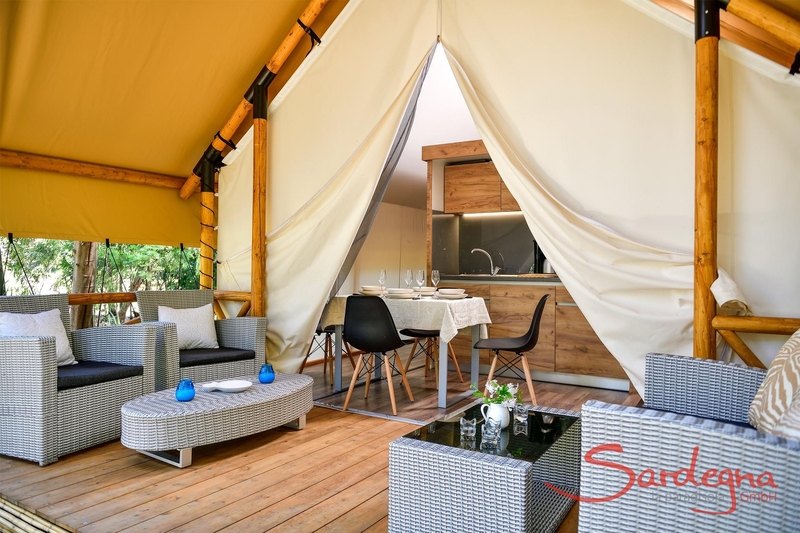 A stay at our Orri tent lodge is sure to be an unforgettable experience for two or for your whole family.Close to nature, directly on the seaThe cleverly designed tent is made of wood, iron and fabric. 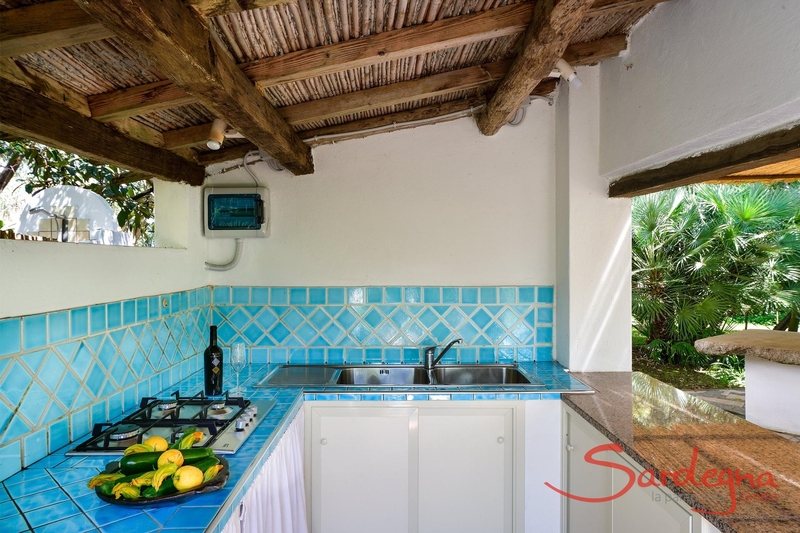 It has minimal impact on the ecology while offering a lot of comforts: running water, electricity, air conditioning, a parquet floor and a fully-equipped kitchen. 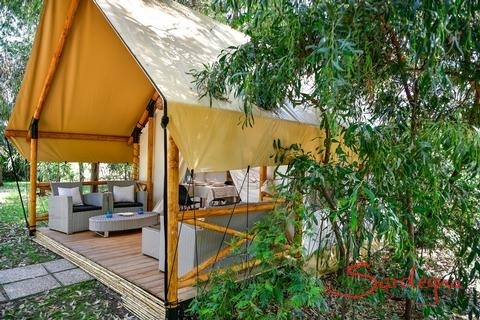 The tent has two bedrooms: one with a double bed and one with a bunk bed. 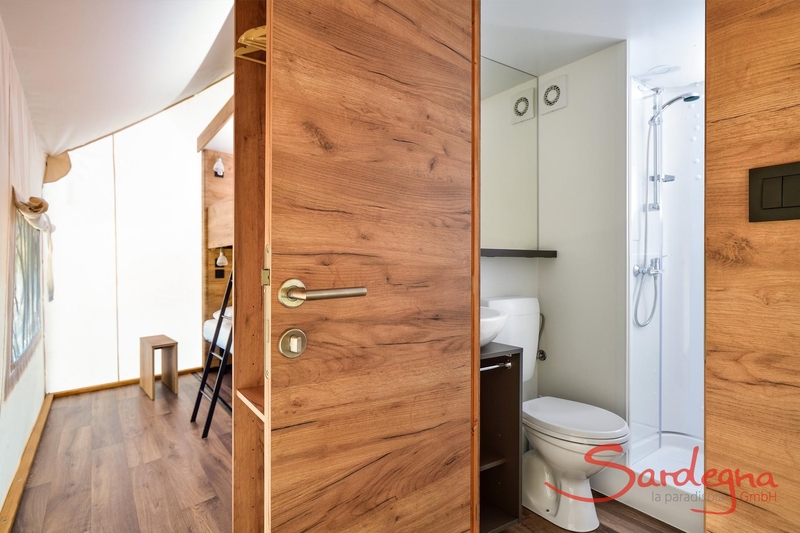 There is also a shower room, a kitchenette with plenty of storage space, a sink and an induction hob. 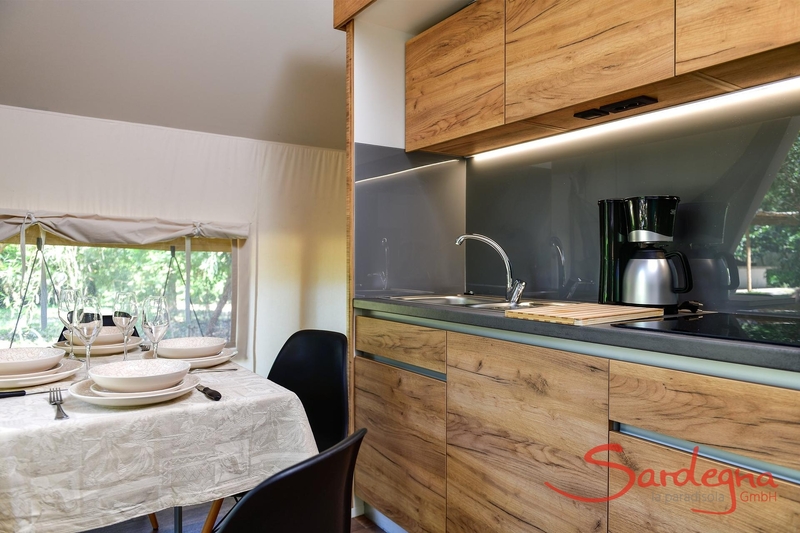 A comfortable dining table for four people stands in front of the kitchenette with a view of the trees through the tent entrance. 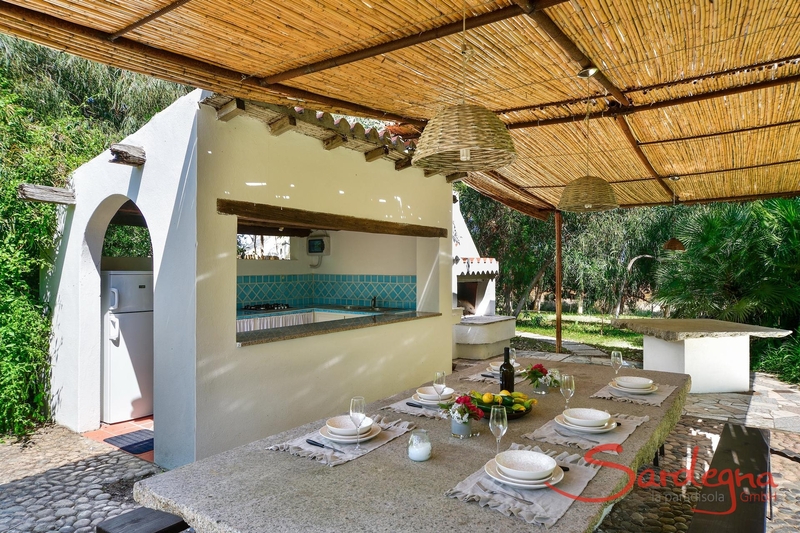 In front of the kitchen and the dining area is a covered terrace fitted with cozy lounge furniture. 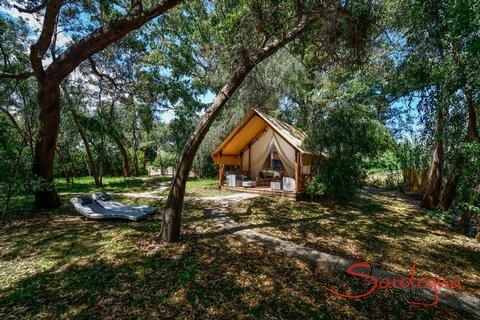 Outside you can dream under fragrant pine and eucalyptus trees on two loungers. And an opaque outdoor shower is also part of the Orri tent lodge. A washing machine is also available. Those who like to cook and eat well will be pleased: the boutique tent has a gorgeous covered outdoor kitchen with a gas cooker, fridge, sink and large brick barbecue. You can serve on one of the two large granite tables; the other table serves as a sideboard for the grill master.In the immediate vicinityThe village of Tortoli is only 2 km away and offers good shopping, restaurants and a rich selection of home-grown fruit and vegetables. 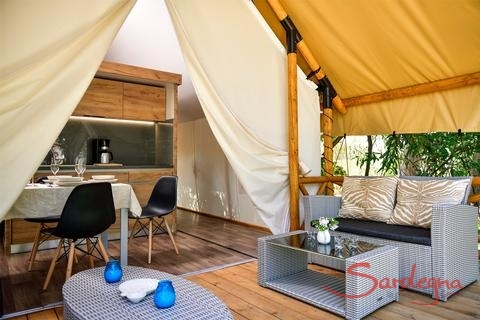 Living in nature with an easy connection to village life gives the Orri tent lodge an exceptional charm. The most beautiful beaches in the area can be reached in only a few minutes. The small airport is also nearby. Only about two flights land per day in order to ensure the idyllic area remains undisturbed. The nearby Arbatax with its famous red rock can be reached in 20 minutes by car. There is also a romantic harbor with local fish restaurants awaiting you. The "Trenino Verde", a small railroad, leaves from the port and meanders through the interior of Sardinia. Several times a day excursion boats launch headed to the breathtaking cliffs between Arbatax and Orosei. The small sandy coves open into a vast underground labyrinth of caves and caverns only accessible by boat. Orri Apartment Due is a charming garden apartment on the east coast of Sardinia, on one of the most beautiful coastlines of the Mediterranean. In the garden you can relax under two huge palm trees. The garden extends to the beautiful beach, which can be reached after a few steps. Book now! Rooftop apartment Orri - sensational location directly on the beach of Orri and on the legendary East Coast of Sardinia, which is considered to be one of the most beautiful coastlines in the Mediterranean. Orri Apartment Uno is a charming garden apartment on the east coast of Sardinia, on one of the most beautiful coastlines of the Mediterranean. In the garden you can relax under two huge palm trees. The garden extends to the beautiful beach, which can be reached after a few steps. Book now!